During one toddler nap session this past week, my wife and I built a toddler learning tower for our son. The idea behind learning towers is that if you build your toddler a tower the right height, they can hang out with you at kitchen counter level and from up there they can participate in the creation of meals and other grownup activities. Learning towers retail for $120 to $200, so we figured it would be a lot cheaper to just build our own. While we built it, we documented the steps and took lots of pictures. Hopefully, you’ll see how easy it is to build your own! Our son seems a lot more patient while we make meals now that he can climb into his learning tower and watch! 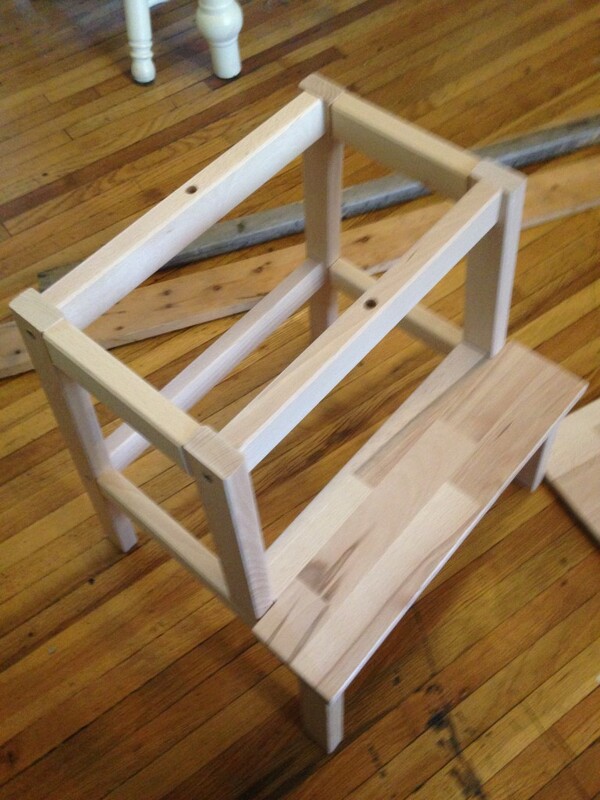 The cheap and sturdy $15 Bekvam stool from Ikea is a great base for a learning tower. 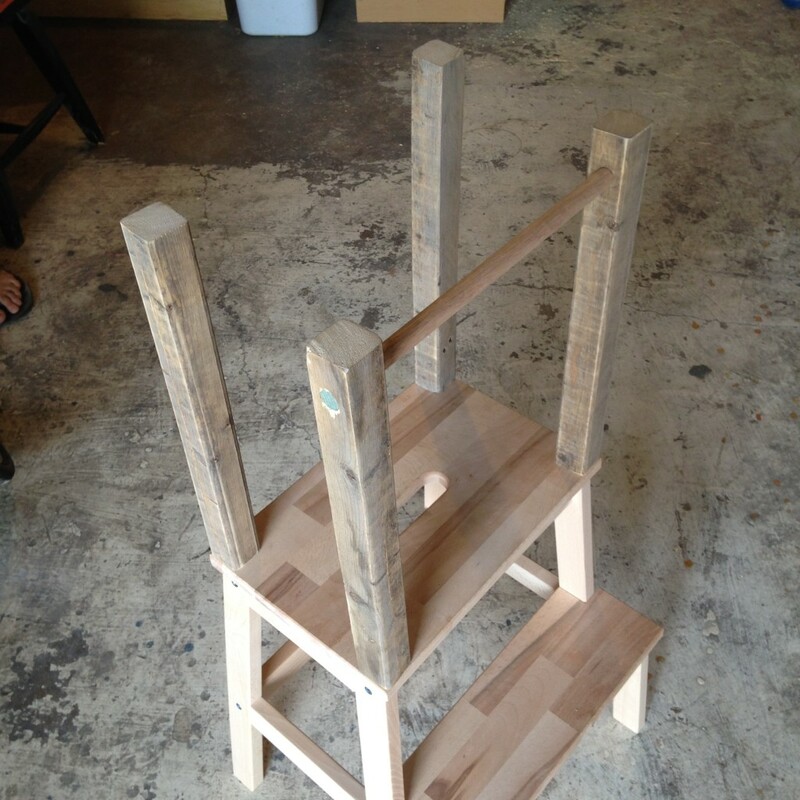 We’d read a few other blog posts about DIY-ers creating learning towers from Ikea stools, so on our last trip to Ikea we picked up the $15 Bekvam stool. To gather the rest of the required materials, we made a trip to Boulder’s ReSource Yard for some used lumber that would be used in the top portion of the learning tower. 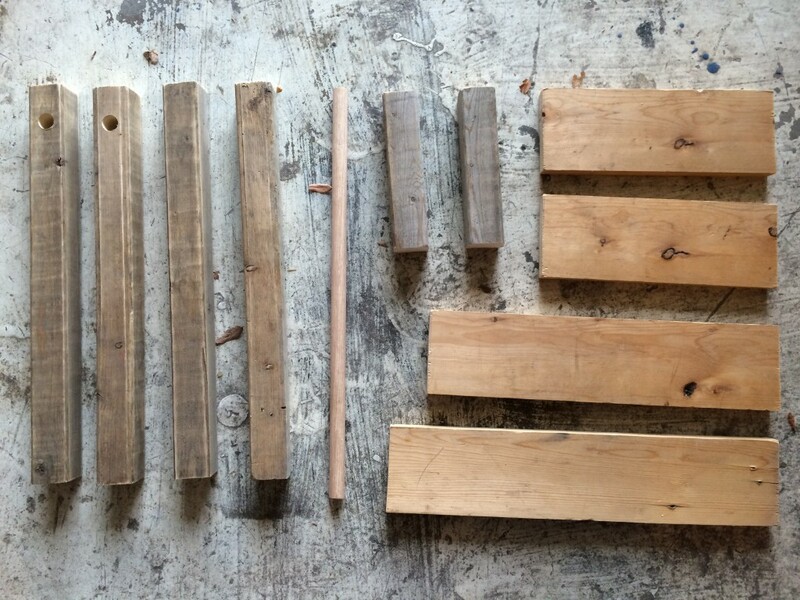 We needed to buy a few long 1.5″ x 1.5″ and 3/4″ x 3.5″ pieces of wood, in addition to a 5/8″ dowel. Exact measurements needed are included later in the post. 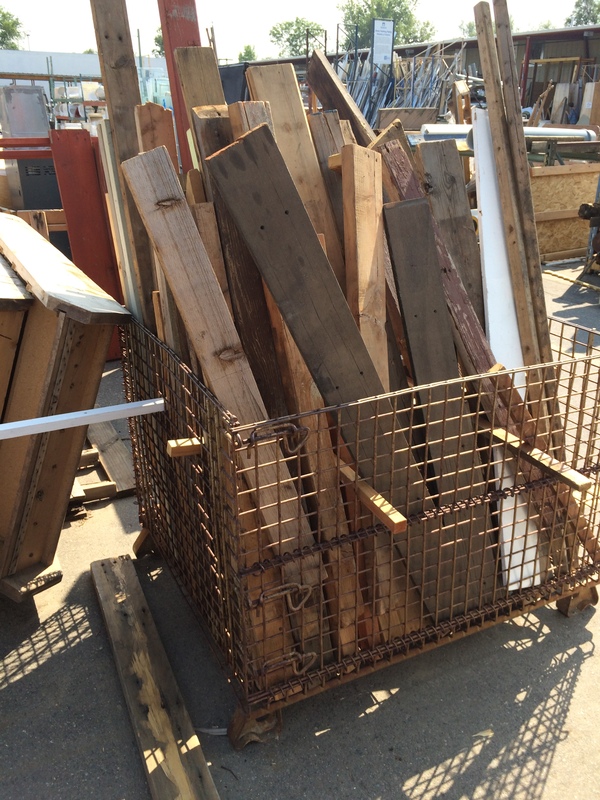 We were able to find everything except for the dowel at the lumber yard for a total of $1. We bought the dowel new at Home Depot. The height of your learning tower may differ from ours a little bit, depending on the height of your kitchen counter. To find out how tall our corner poles should be, we placed the stool next to our counters and measured the distance from the top of the stool to the counter. In our case, this was 16 inches. The pieces of wood we needed to cut to complete the learning tower. 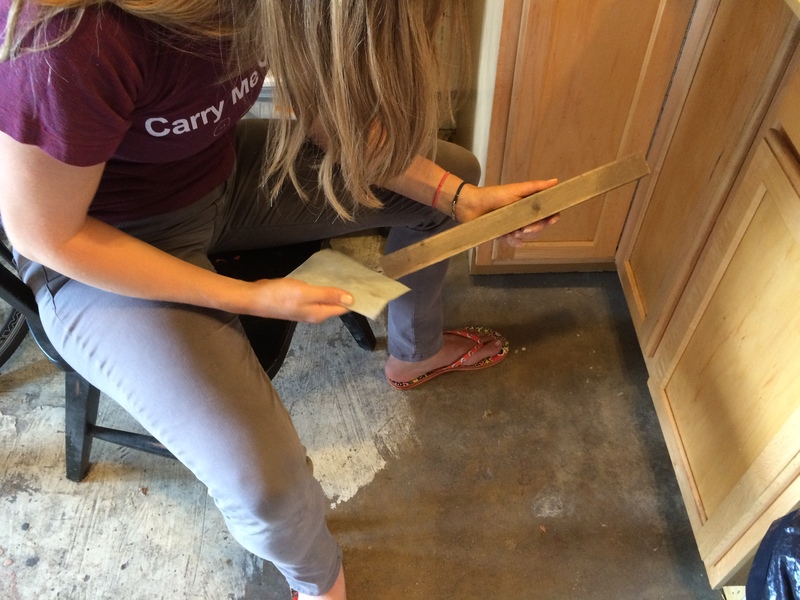 Cut the 1.5″ x 1.5″ poles down to 16 inches, or the difference between your counter top and the stool platform. 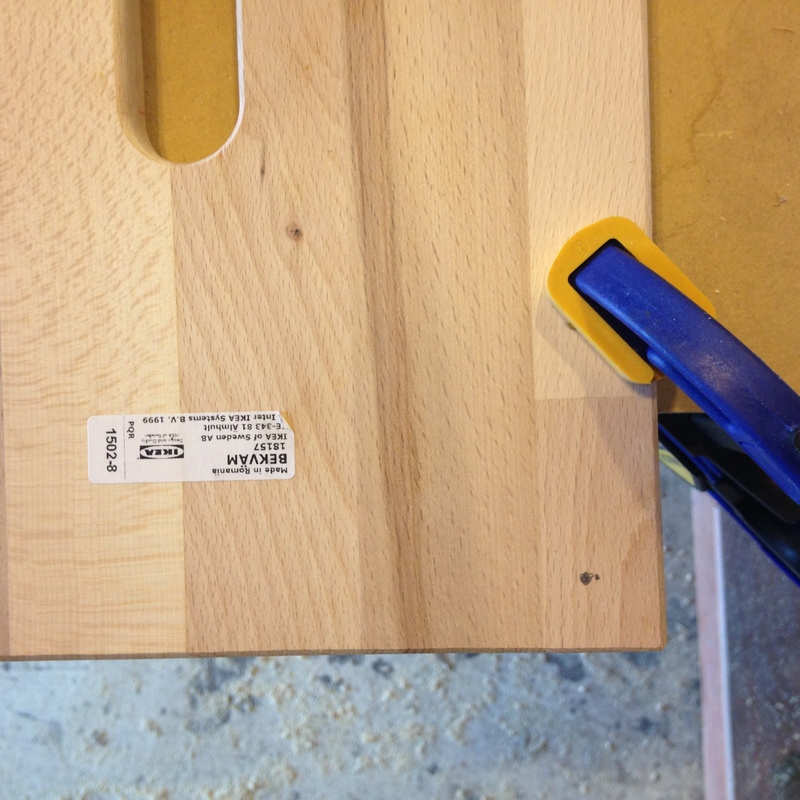 We found that it helped to clamp the lumber to a work surface before cutting with a circular saw. 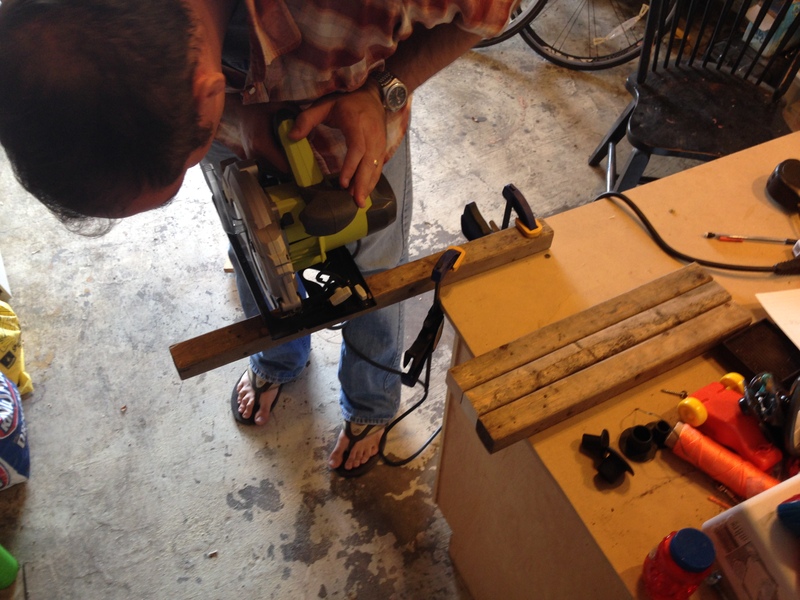 Next, cut the other lumber to the correct lengths. 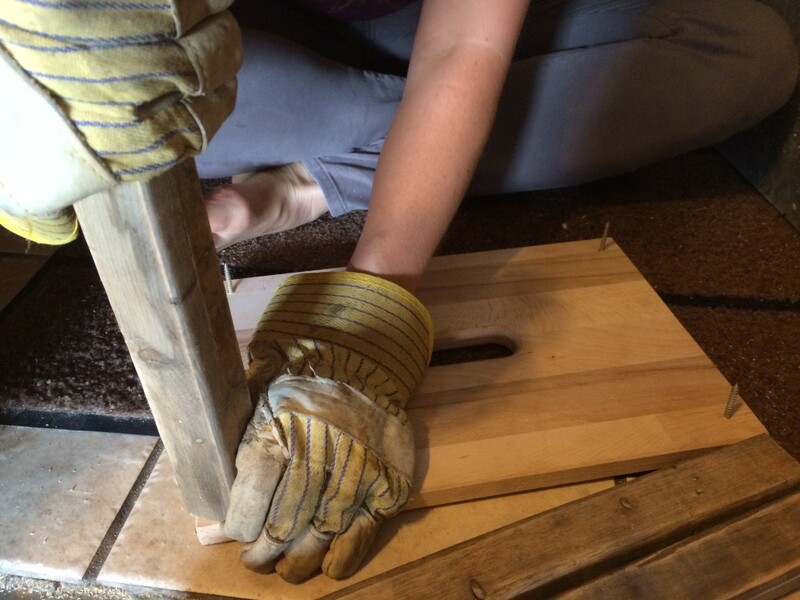 Since it was old lumber and the goal was a piece of furniture for a toddler, we sanded down the cut pieces to remove splinters. Drill a 5/8″ hole through two of the 16″ lengths of 1.5″ x 1.5″ pole. We drilled these holes 1.5″ in from one end. 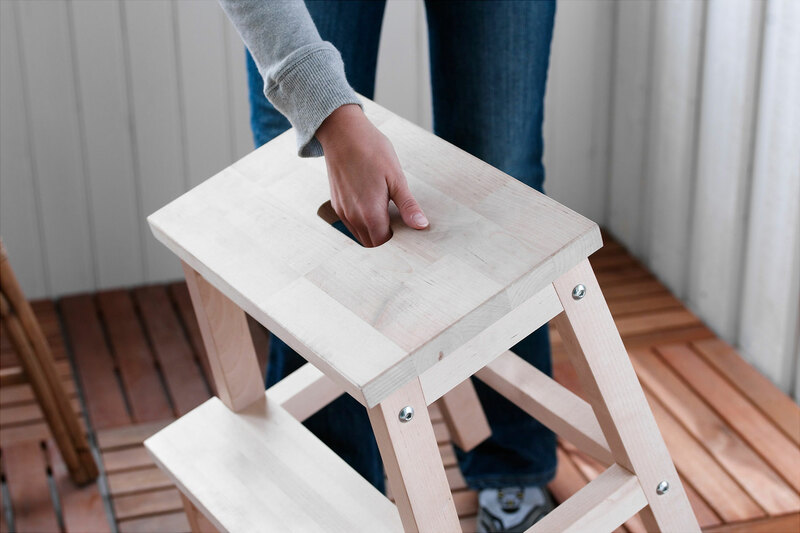 Next, remove the top platform from the stool. You’ll build the rest of the tower onto the platform. 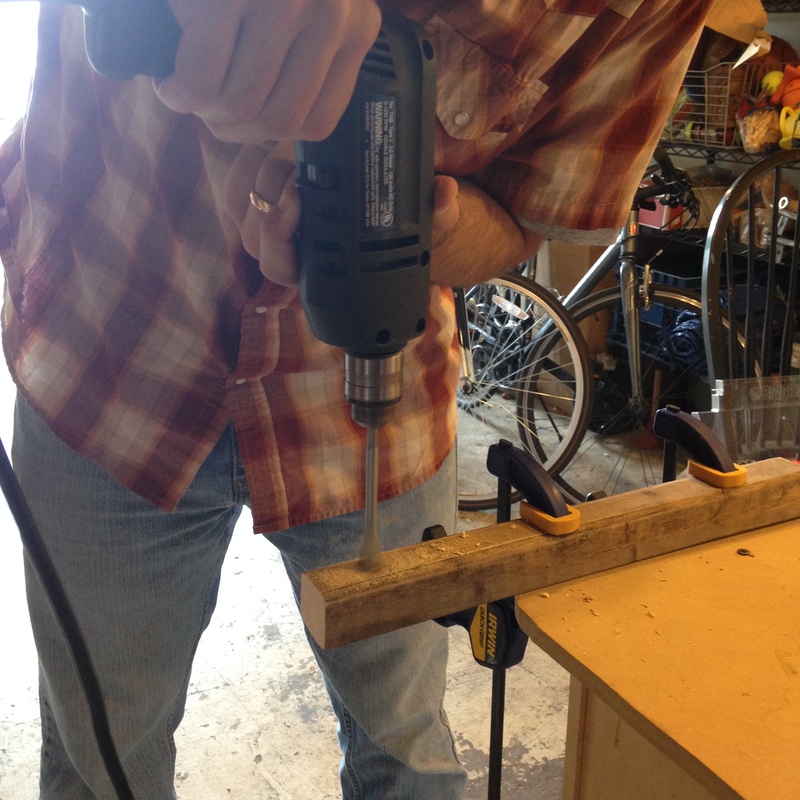 Drill pilot holes 3/4″ in from the corners of the stool platform. This is where the uprights will get screwed into the platform. Drill pilot holes in the ends of the uprights as well, then screw them onto the platform. We were careful in this step to make sure the two uprights with holes for the dowel were opposite each other on one side. 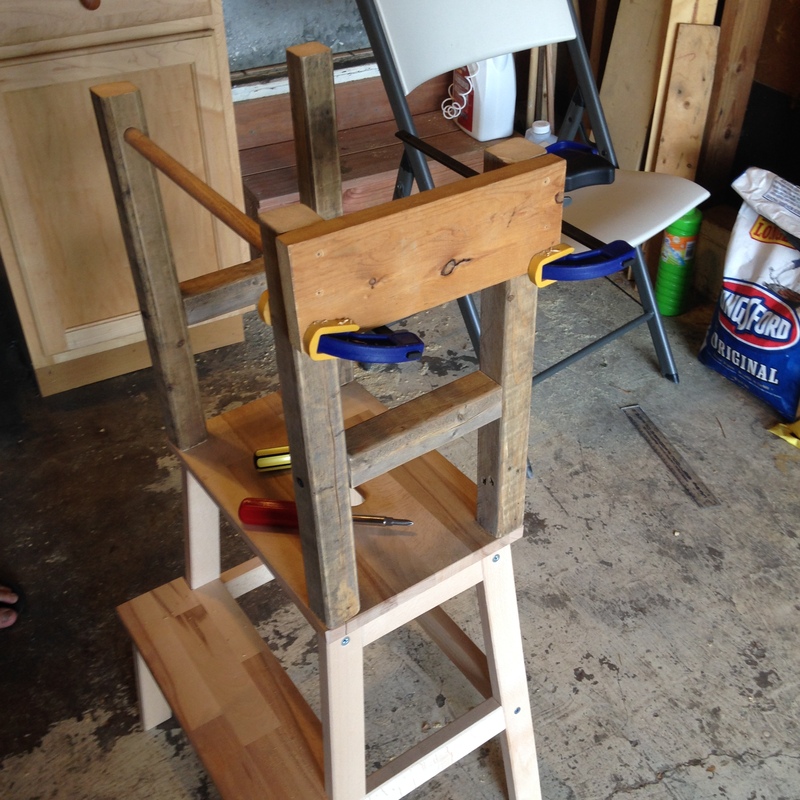 With the uprights attached to the platform, screw the platform back onto the stool again and run the dowel through the 5/8″ holes. 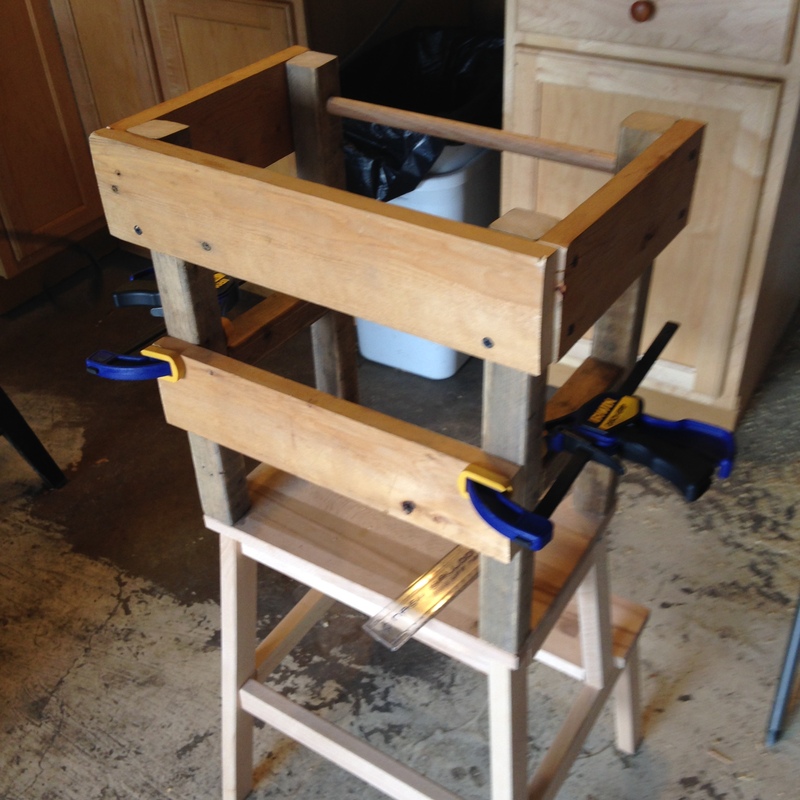 Next, attach the 1.5″ x 1.5″ and 3/4″ x 3.5″ side rails. We used clamps for positioning to help ensure a smooth top railing. Once the side rails are on, attach the two front rails. Consider that these will most likely be used by your toddler as a ladder at some point; however, our son also uses the rails to help him climb in, so we are glad we built them where we did. With all of the rails attached, the learning tower was structurally complete. We brought it outside for painting. 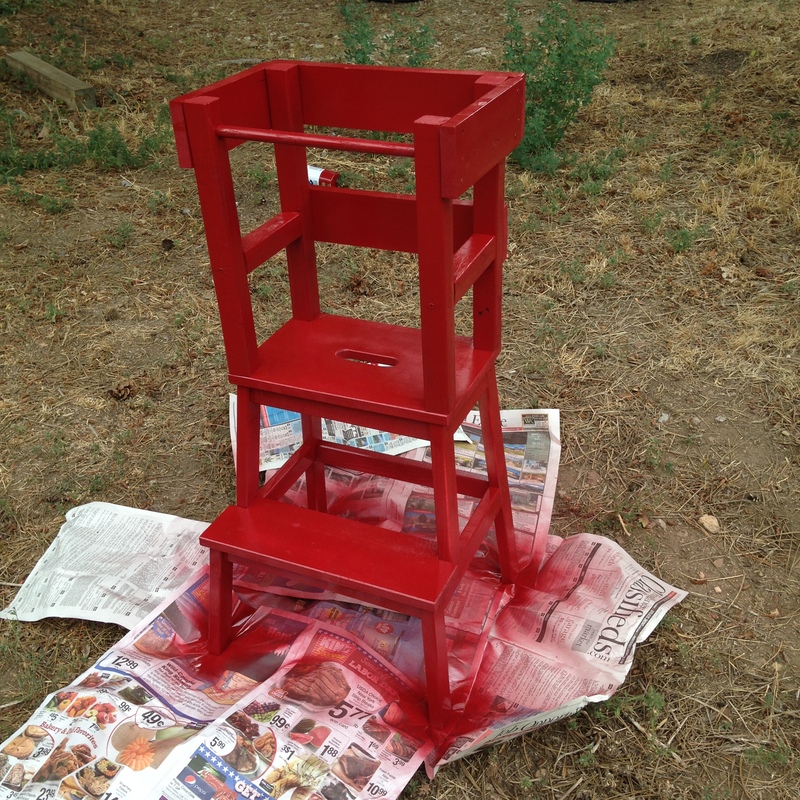 It took a little less than two cans of Rustoleum spray paint to paint the tower red. 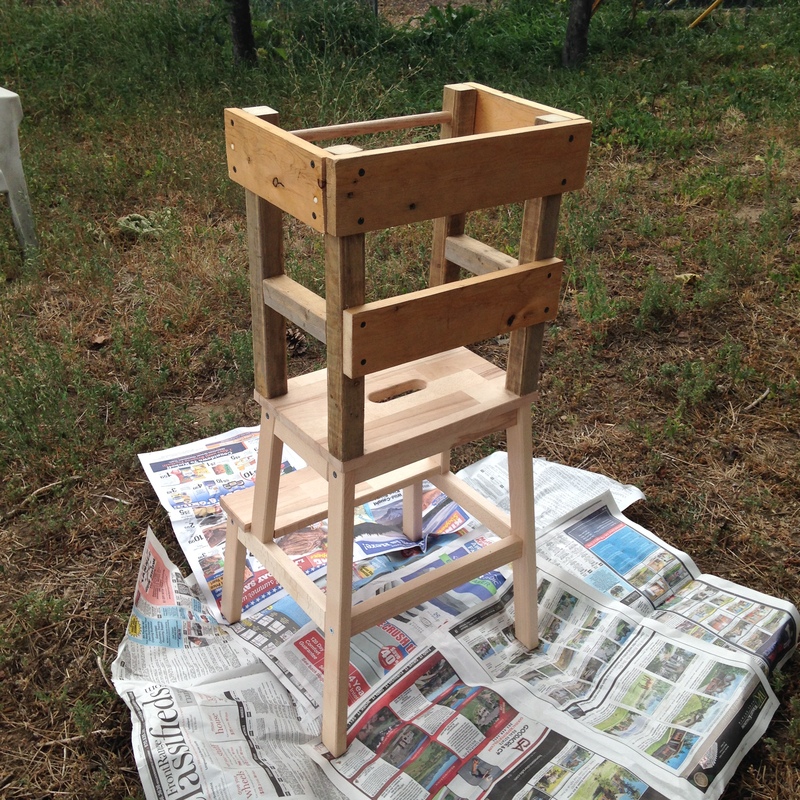 The spray paint we chose had primer in it so it wouldn’t just soak into the wood. Our son immediately climbed into the learning tower and began playing with things on our kitchen island. It really was pretty easy to make the learning tower, and it only took two and half hours. However, if it seems too daunting, here is a link to a post with a great range of different retail learning tower options. We’d love to hear about your similar projects / questions below in the comments! ← Creating Minimalist CSS Landscape Art. I have never seen one of these and I’m so excited to share with my kids. 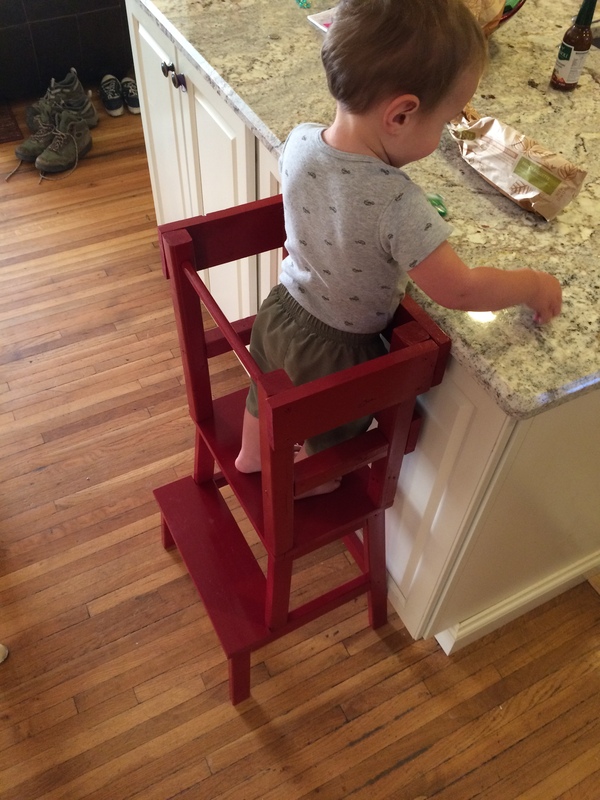 I can definitely see one coming soon to our kitchen…the grandparent’s toddler stool. It is also really cool to see this from you, my favorite cousin’s son (your Dad). Awesome!!! !